The 800 Polaris® TITAN™ XC model is a high-performance, cross-country tough sled. It features the Cobra track with aggressive 1.8 inch lugs, Gripper skis, and a premium FOX® Shock package. TOWING & CARRYING CAPABILITIES: TITAN models offer unmatched cargo carrying and towing capabilities, and with a 1,200 lb. (544 kg) towing capacity, they can tow more than competitive sleds. Innovative storage solutions optimize available space & utilize impressive TITAN hauling power. Integrated cargo mounting systems let riders add or remove cargo quickly & easily. Sled is engineered to maintain its Rider-Balanced Control with any size cargo load. INTEGRATED LOCK & RIDE VERSA STORAGE PLATFORM: Innovative, Polaris TITAN-exclusive storage system optimizes convenience and security of carrying cargo. Industry-leading carrying capacity of 85 lb. (38.5 kg.). Integrated design allows for maximum storage, with or without passenger seat. Platform designed to hold two 5-gallon buckets, ideal for hauling fishing gear, tools, firewood & much more. Integrated Lock & Ride® mounting system to hold accessory cargo box. Includes bars where tie-down straps can be attached. Ribbed underside of platform perimeter prevents bungee hooks from sliding. POLARIS TITAN CARGO ACCESSORIES: Storage solutions are available for every type of cargo you need to carry. Every bag and carrier features durable, all-weather construction and easy, secure installation. Accessory cargo bags available include: Handlebar Bag, Windshield Bag, Lock & Ride® Under Passenger Seat Bag & more. Kolpin® Quick Attach Gun & Rod Lockers hold firearms & fishing gear securely. Ice Auger Mount makes it easy to transport ice fishing equipment. FOX QS3 CLICKER SHOES: High-performance, adjustable, and rebuildable FOX® QS3 Clicker shocks offer easy pre-ride adjustability and deliver outstanding performance on- and off-trail. Tool-free adjuster allows for simple and repeatable suspension setting changes. Wide range of compression adjustment provides noticeable changes of ride quality and handling without the complications of counting detents. Remote reservoir promotes heat dissipation & ensures consistently outstanding performance in all riding conditions. 20 X 155 X 1.8 COBRA TRACK: Proven, versatile Cobra track provides excellent off-trail flotation and aggressive traction on-trail. Stiff Cobra design lugs offer superior performance in off trail loose snow application with traction to spare. 1.8” height provides better towing response on and off trail for the most demanding deep snow conditions. Strong, stiff lugs won’t fold over like some deep snow tracks’ softer, more pliant lugs. 800 CLEANFIRE H.O. ENGINE: Developed in conjunction with the AXYS platform, the proven 800 Cleanfire® H.O. Engine delivers class-leading acceleration. The integrated mounting position optimizes the balance of the chassis. 3-stage electronically-controlled exhaust valves. Electronic oil pump. Thermostat with bypass warms up to operating temperature 40% faster and improves durability. High-efficiency intake and exhaust. VForce Reeds. Lightweight crankshaft. Throttle body is lighter weight and reduces throttle effort. Grooved Piston. GRIPPER SKIS: Skis deliver flotation in deep snow & smooth, easy handling on-trail. Top surface features serrated edges for boot traction in deep snow. EXTENDED WIND PROTECTION: Polaris TITAN's integrated wind protection enhances riders’ comfort. Extended AXYS Wind Foils deflect wind around riders. AXYS DEEP SNOW MID 13 IN. WINDSHIELD: Deep Snow Mid 13" windshield deflects wind, snow, branches, etc., for enhanced rider protection. 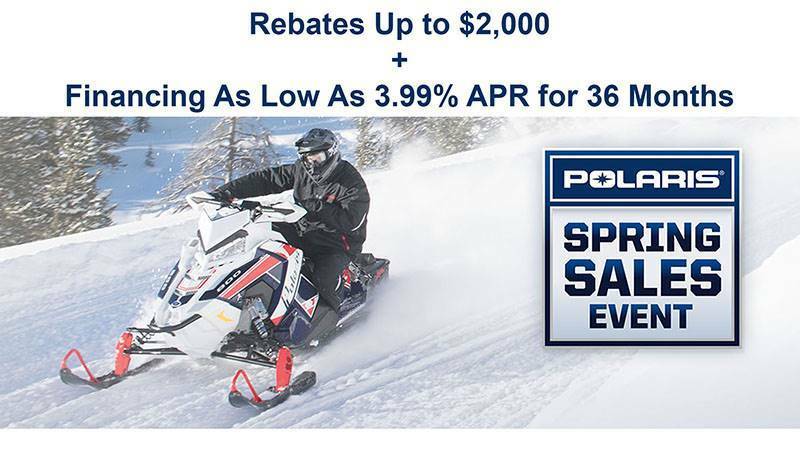 POLARIS INTERACTIVE DIGITAL DISPLAY: Another industry first for Polaris - the most advanced instrumentation in snowmobiling. This 4.3" high resolution, full color, LCD digital display provides a rider with information. Sled performance: Speedometer, tachometer, dual tripmeters, average speed, max speed, engine/trip hours & odometer. Sled operating conditions: Coolant temperature, diagnostics & maintenance warnings. Riding conditions: Air temperature, time of day in 12 or 24-hour clock format. Bluetooth™ functionality: Enables the gauge to communicate with the rider’s cell phone and provide notification of incoming calls or texts. Displays phone battery & signal strength. GPS/Mapping Capability: A compass is standard, & full-featured GPS can be installed to provide directions & information about services such as fuel, restaurants, lodging & Polaris dealerships. Customize the GPS to operate with North Up or Course Up navigation depending on your preference. Ride Planning Feature enables you to plan a ride using Ride Command, save it as a GPX file, and transfer it to the display through the USB interface. This gauge is available as an accessory option for the TITAN SP or TITAN XC. MESSAGECENTER GAUGE: Informative and easy to read, this instrumentation keeps a rider aware of sled operating conditions and provides a wealth of additional data. Easily viewable LCD screen, 4.3"" diagonal measurement. Scrolling message center keeps rider informed. Large buttons can be operated with gloved hands. Brightly lit display is easily readable in all light conditions.